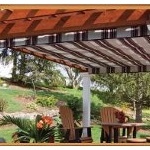 We specialize in shade structures of all shapes and sizes from gazebos and pergolas to pavilions and sunrooms. Our goal is helping our customers enjoy the outdoors more throughout the seasons. That's why this season, in addition to offering our great line of shade structures, we're introducing our EZShade Systems to provide even better shade protection! Our standard wooden gazebos are made of pressure-treated southern yellow pine. Our heavy-duty floor consists of double 2x6 joists and solid 2x6 wood decking boards. 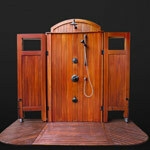 Outdoor showers have been a fixture of fine homes for years. They possess a special charm that immediately invokes what we love most about warm weather: the beach, swimming pools, barbeques and precious moments with family and friends. What outdoor showers normally lack, though, is refined design and quality construction. A pavilion is the perfect gathering place for any event. Whether you are hosting a dinner party or simply relaxing in the evening with your family,this unique pavilion provides a cool atmosphere for any type of fellowship. Add the right touch of elegance to your garden or yard with a quality built patio pergola or garden pergola! An outdoor pergola can be used to train your roses or vines, create a touch of architectural interest or offer loved ones a great place to relax and enjoy the scenery. Enhance your home with a new cabana for that perfect dream room. Our cabanas create a comfortable place to enjoy the view, relax, recharge, dream and just get away from it all! Our Sunrooms offer a three season outdoor room and come standard with VinyLite Windows.